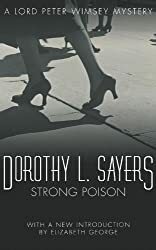 I’m no longer attempting to write about every book I read but I do want to record a few of my thoughts on two of Dorothy L Sayers’ books that I’ve read recently because they are both such good books. However, I doubt very much that I can do justice to either of these books. Dorothy Leigh Sayers (1893-1957) was born at Christchurch Cathedral School, Oxford, where her father was the headmaster. She learned Latin and French at the age of seven, went to Somerville College, Oxford and in 1915 she graduated with a first class honours degree in modern languages. She is best known as the creator of Lord Peter Wimsey, but as well as writing crime fiction she also wrote poems, plays, essays, books on religion and was a translator – most notably of Dante’s Divine Comedy. 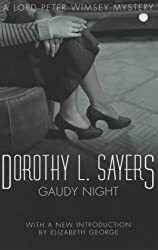 The two of her books I’ve read recently are Strong Poison (first published in 1930) and Gaudy Night (first published in 1935), both featuring Harriet Vane, a crime fiction novelist, and her relationship with Lord Peter Wimsey, the aristocratic amateur detective. The two first meet in Strong Poison, when Harriet is on trial for the murder of her former lover, Philip Boyes. Wimsey, attending the trial, is convinced she is innocent and sets out to prove it … and falls in love with her. The Crown’s case is watertight. The police are adamant that the right person is on trial. The judge’s summing up is also clear. Harriet Vane is guilty of killing her lover and Harriet Vane must hang. But the jury disagrees. Well, actually one member of the jury won’t agree that she is guilty – that is Miss Climpson, an elderly spinster, who just happens to run what Wimsey calls ‘My Cattery’, ostensibly a typing bureau, but actually an amateur detective/enquiry agency. Wimsey decides that Harriet is innocent, Boyes, who died poisoned by arsenic, either committed suicide or was murdered by someone else. It is Miss Climpson and her employees, mainly spinsters with small fixed incomes, or no incomes, widows without families, or women deserted by their husband, who do the investigations. This involves Miss Climpson posing as a medium and Miss Murchison learning how to pick a lock. To sum up – this is a delightful book, full of strong characters, a mystery to solve, superbly written with humour as well as ingenuity. An d then there is Gaudy Night, which is even better than Strong Poison. I loved the setting in this book – Shrewsbury College, a fictional all female college, at Oxford University (based on Somerville College, Sayers’ own college). The action of the book takes place in 1935, five years after Harriet’s trial in Strong Poison. During those five years Harriet and Wimsey have had an ongoing ‘relationship’ in which he annually asks her to marry him and she refuses. They had also worked together on a murder at Wilvercombe, as told in Have His Carcase, a book I have yet to read. Gaudy Night begins as Harriet decides to go back to Shrewsbury College to attend the Shrewsbury Gaudy (a college reunion involving a celebratory dinner), not sure she can face meeting her fellow students and the dons. It doesn’t go well – there are poison pen letters, nasty graffiti and vandalism causing mayhem and upset. Harriet is asked to investigate, under pretence of helping one of the dons to rewrite her manuscript that had been destroyed in one of the nightly attacks and researching the life and works of Sheridan Lefanu. Struggling to discover the culprit and afraid it will end in murder she asks Wimsey for help. This is a complex novel, with many characters, some of whom I found difficult to visualise, whereas others were vividly depicted, their thoughts, actions and feelings clearly evident. I had no idea who the writer of the poison pen letters etc could be and I was completely absorbed in the mystery. But what gives both books so much depth is the portrayal of life between the two world wars, the exploration of the role of women in society, particularly with regard to education and marriage and the importance of truth and honesty; not forgetting, the ongoing relationship between Harriet and Lord Peter Wimsey. Of the two books I preferred Gaudy Night, but both are excellent and a pleasure to read. They are both really re-readable books too, which I think is marker of a book’s quality, esp. when one knows the solution the second time around! I agree Vicky – definitely both books would stand up to re-reading. Excellent post about these super books, Margaret. I love her intelligent writing and feel DLS’s writing would stand up against any of the so-called ‘classics’. Oh, ‘do’ read Have His Carcase… it’s so good. I have Busman’s Honeymoon to read next but also want to go back read some of the earlier books. I’ve only read one of those, Clouds of Witness, which I thought was also rather good. Thanks, Cath. DLS certainly does write literary fiction as good as any ‘classic’! I’ve now reserved Have His Carcase at the library and am looking forward to read more of her books. Excellent review of two of my all-time favorite mysteries–and you’re right, Gaudy Night is a complex book. I read it before I started blogging, so I’ve never attempted to review it, but I know how challenging a book it is to get it down to its essentials.